Back in December 2008 Econsultancy redesigned their site with a dramatic new look. I know it was a tough project for them and that's why I'm trying hard to get used to the new feel. It seems to be working - I'm too lazy to check comScore (where I'm pretty sure Econsultancy is large enough to be tracked) tonight - but thankfully James Gordon-MacIntosh from the Seven Seventy blog is far less lazy than I! James has battled with AdAge's new look for the Power 150 and put together the chart that shows just the UK's movers and shakers. 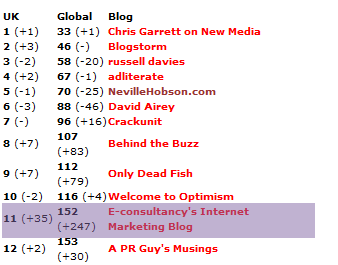 Look at that impressive boost for Econsultancy; up 247 global places and up 35 places just in the UK. Will they crack the top 10? I hope so.